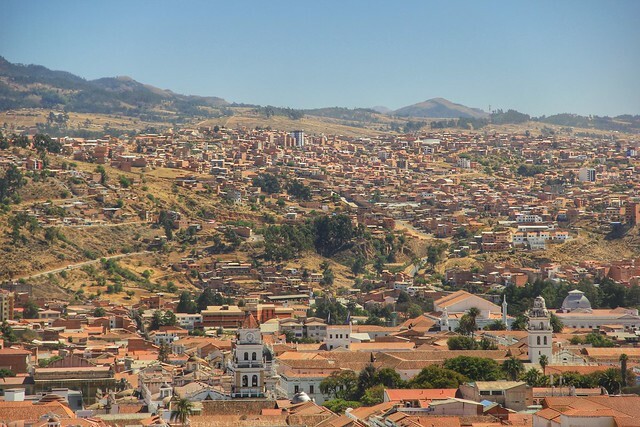 Sucre is hands down one of the most delightful capital cities I’ve ever visited – primarily because it doesn’t feel like a capital city. 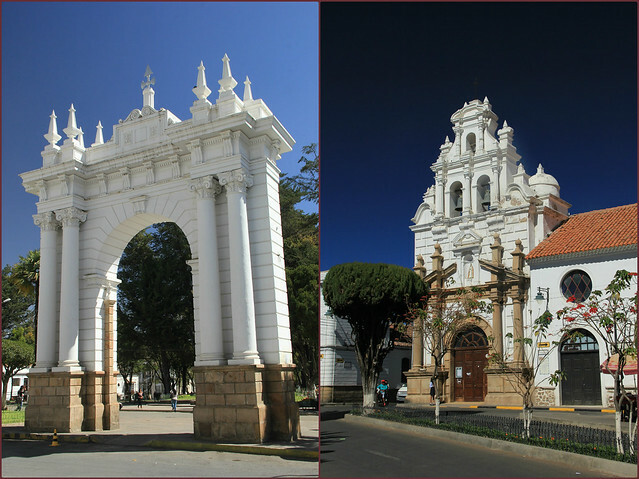 Its compact network of streets are lined with attractive white-washed colonial architecture, earning Sucre its title of La Ciudad Blanca – The White City. 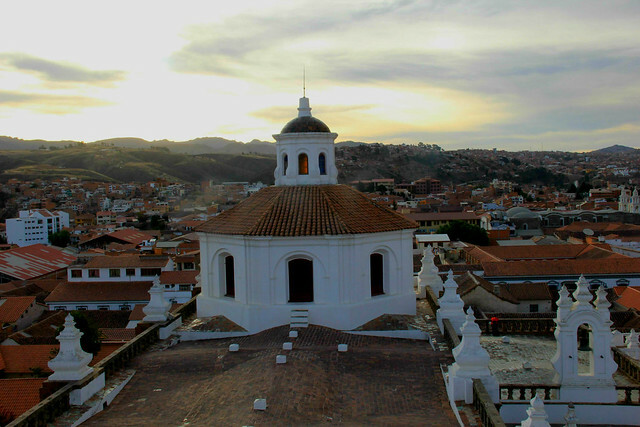 I based myself in Sucre for three weeks, in order to take Spanish lessons at one of the local language schools. I’d attend classes every morning during the week, leaving my afternoons and weekends free to explore the many sights and attractions this charming city has to offer. 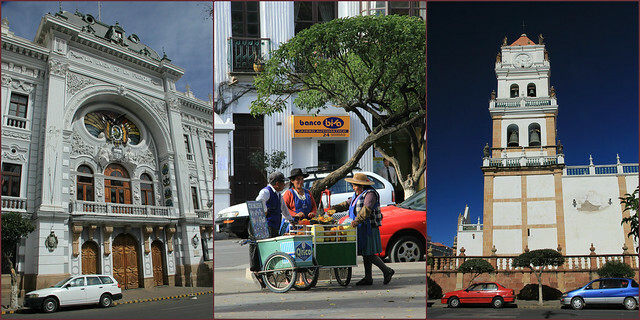 This is Sucre’s main square and the central hub of its historical core. 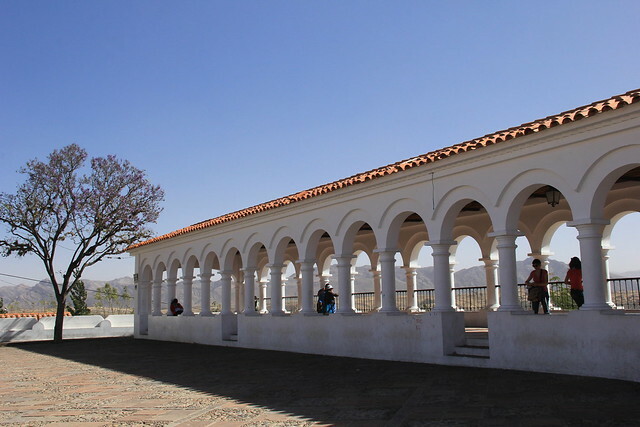 It’s one of the prettiest plazas in Bolivia, with an abundance of trees that create some beautifully shaded areas in which to shelter from the heat of the midday sun. 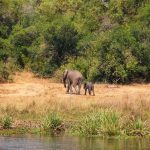 Despite being surrounded by busy roads, and permanently frequented by crowds of locals and tourists, it manages to retain a sense of peace and tranquility. Plaza 25 de Mayo is flanked by two of the city’s most important buildings, the Cathedral and the Casa de la Libertad, as well as some inviting cafés and restaurants. One of my favourite pastimes here was to grab a window seat at Café Metro (on the southeastern corner of the plaza), and savour one of their speciality coffees while watching the lives of the city’s residents play out on the busy streets in front of me. Of all the ‘attractions’ in Sucre this was definitely one of the most photogenic. 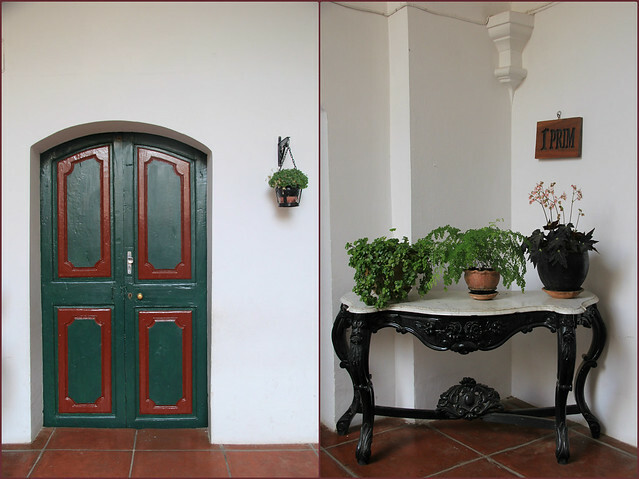 The building contains beautifully preserved corridors with thoughtful decor and design features, and a large inner courtyard. 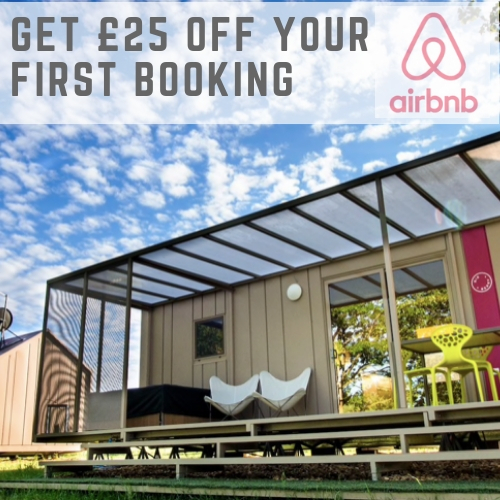 However the real delight can be found up on the tiled rooftops, where you’ll be rewarded with some incredible 360 degree views of the city. 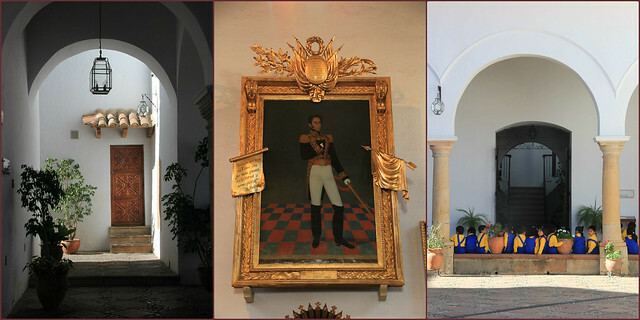 Built between 1795 and 1799 by Friar Antonio de San José Alberto, the neoclassical-style San Felipe Neri historically the served as a monastery, but is now used as an all-girls parochial school. It’s open to the public from 2:30-6:00pm Monday-Saturday, and a visit here is totally worth the B10 entrance fee. Good to know: The gate may be padlocked when you arrive, but don’t dismay – you just need to ring the bell (to the right of the padlocked gate) to be let in. From Grau, it’s about a 10-minute walk up a very steep hill to reach Plaza Recoleta (or Plaza Pedro de Anzúrez, as it’s also known), but the views from up here make the short hike completely worthwhile. There’s a lovely little café/restaurant located right on the edge of the plaza (isn’t there always? You’d be a fool not to take advantage of the enterprising opportunities a fantastic viewpoint affords) where you can sip a coffee or Pisco Sour and look down on to the city below you. Be sure to take an aimless wander around the streets surrounding this spacious plaza; whilst the architecture is very far removed from that of Sucre’s historical core, it’s a fascinating area with much more of an authentic, local feel. 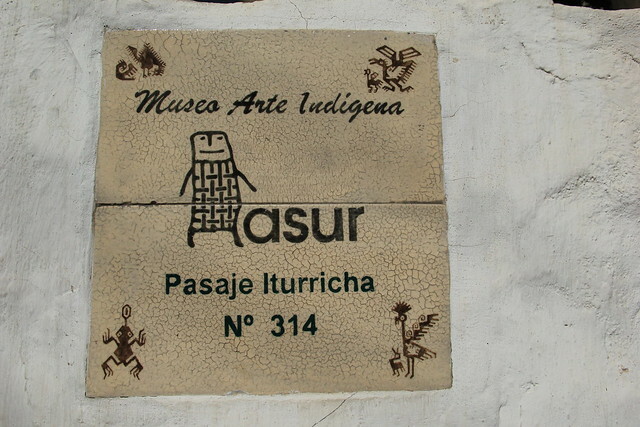 ASUR (Anthropologists of the Southern Andes) is an organisation that helps to promote the production and sale of high quality indigenous arts and textiles by communities in the local area. 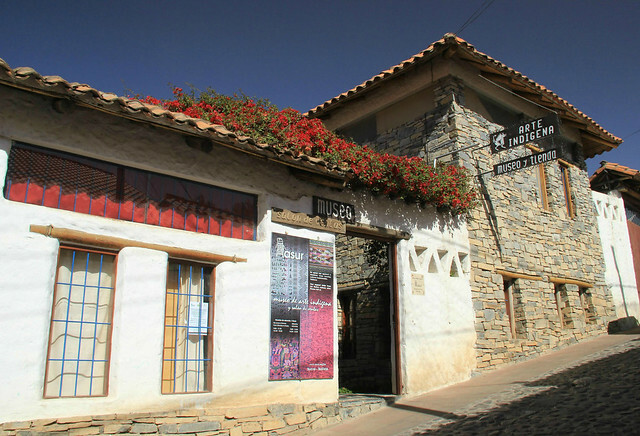 The ASUR Museum of Indigenous Art is located just off Plaza Recoleta (above). There are some incredible works of art and craftsmanship on display here from various different tribes, as well as an entire room dedicated to traditional music and dance, and a number of interactive demonstrations. 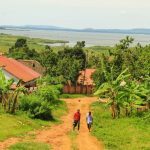 The attached shop is a fantastic place to buy some unique gifts (wall hangings, purses, bags, and scarves/shawls) to take home with you, with profits going towards improving the economic conditions of the communities who produced them. Good to know: the museum is closed between 12:30-2:30pm Mon-Sat and also all day Sunday. Entrance fee is B22. I always find myself sitting on the fence about whether to include cemeteries as ‘sights to see’ within any given city, but some of them are just so damn beautiful that it’s difficult not to. I think the important thing is to be aware of your surroundings as you wander through the grounds, and to be respectful to those people who are clearly grieving their deceased loved ones. 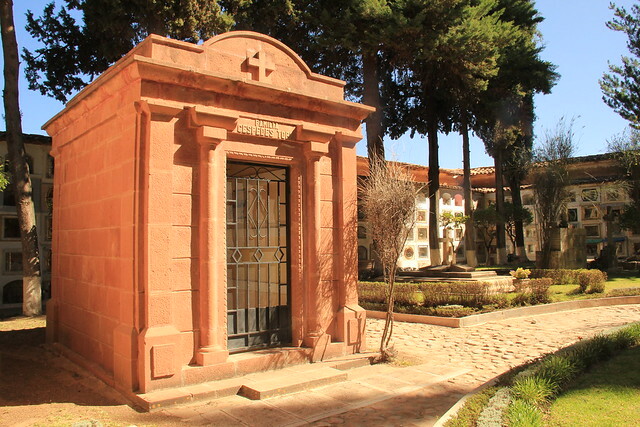 Amongst the countless graves hidden behind glass-plated shrines in Sucre’s Cementerio General are attractive manicured gardens dotted with elegant stone buildings; tombs to the city’s wealthy and elite. 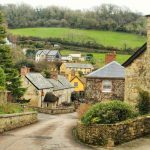 There are wide tree-lined pathways where couples walk arm in arm, chatting and laughing as they pass, workers tend graves and sweep fallen leaves from the ground, and the smell of freshly cut grass and flowers lingers on the breeze. Good to know: Sucre’s Cementerio General is open to the public Mon-Fri 8-11am and 2-5.30pm, and on Sat-Sun 8am-5.30pm. 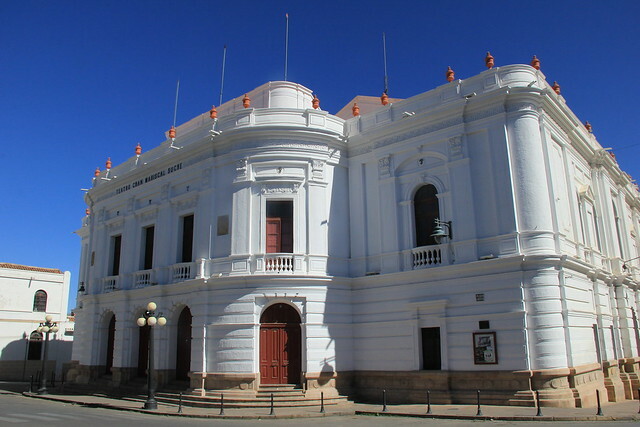 Located right on the edge of Sucre’s Plaza 25 de Mayo, the Casa de la Libertad is one of the most historically significant buildings in Bolivia. 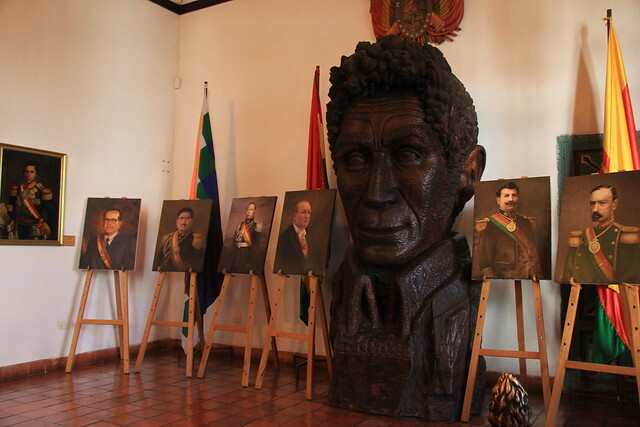 It was here that Bolivia’s independence was declared, on 6 August 1825. 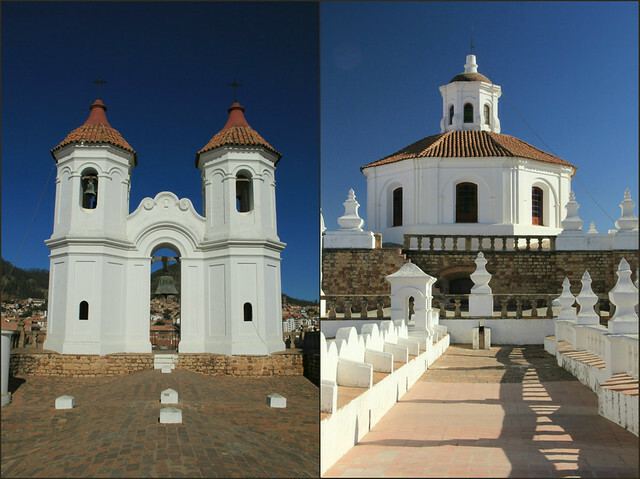 Originally a Jesuit chapel, today Casa de la Libertad is a museum dedicated to one of the most important times in Bolivia’s history. Guided tours are included in the price of your ticket (B15) and are available in French or English. Unless you’re an expert at understanding the language I’d recommend that you take one, because the displays have explanations written in Spanish only. Good to know: Opening times are Tues-Sat 9am-12pm and 2:30-6:30pm; Sun 9am-12pm. If you want to take photographs inside, you’ll need to purchase a Photographer’s Pass for B10. Housed in the impressive former Banco Nacional building, MUSEF (as it’s known locally) provides a wonderful insight into Bolivia’s diverse and colourful cultures from the pre-Colombian era to the present. 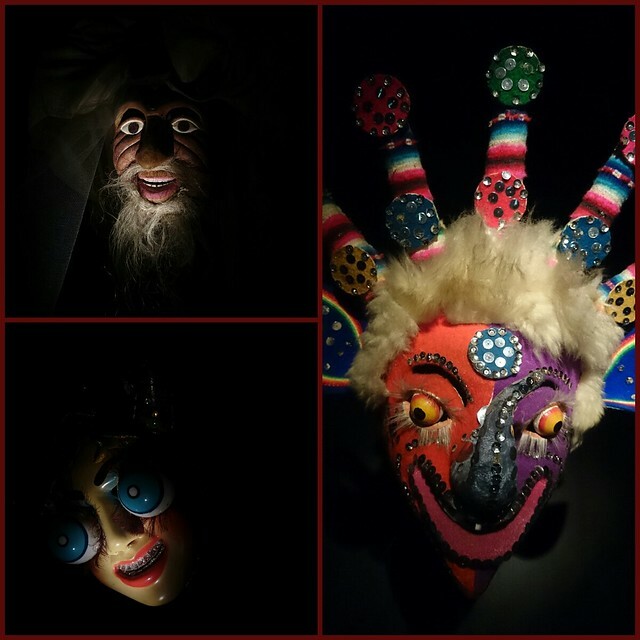 My favourite part was the ground floor Mask Museum, an exhibition spread over four separate dimly-lit rooms that showcases around 50 ornate (some, rather very creepy) masks used in festivals and religious ceremonies in communities throughout Bolivia. Good to know: Opening hours are Mon-Fri 9:30am-12.30pm and 2.30-6.30pm; Sat 9:30am-12:30pm. Entry is free. 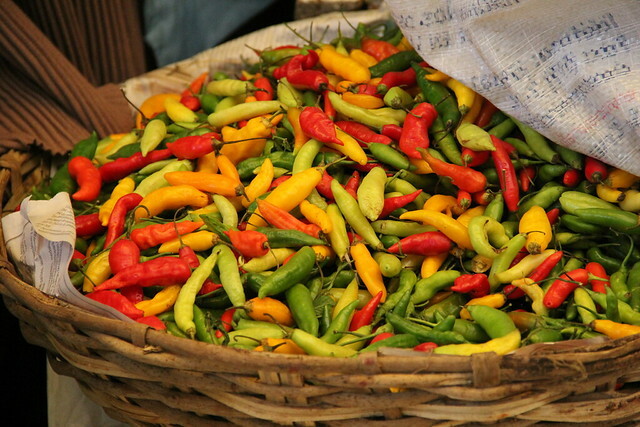 The largest market in Sucre is Mercado Central. 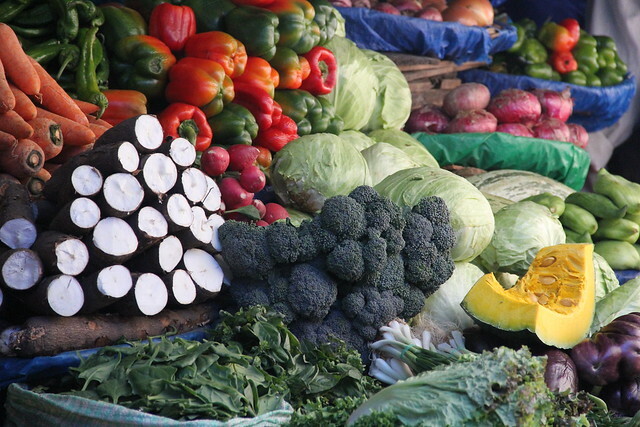 It’s where you’ll find the freshest vegetables, fruits, herbs, spices, pulses, breads, meats and household goods at the cheapest prices. What I love about this place is that you walk into the fruit and veg section and the market vendors will slice you off a piece of their produce for you to try. If you decide you want to buy, they’ll ask you when you plan to eat the avocado/custard apple/mango, so that they can select one at exactly the right level of ripeness for you. Now that’s service! The top floor of the market is dedicated to traditional Bolivian cuisine, with numerous restaurants serving up some ridiculously cheap plates of food from 7am until close. 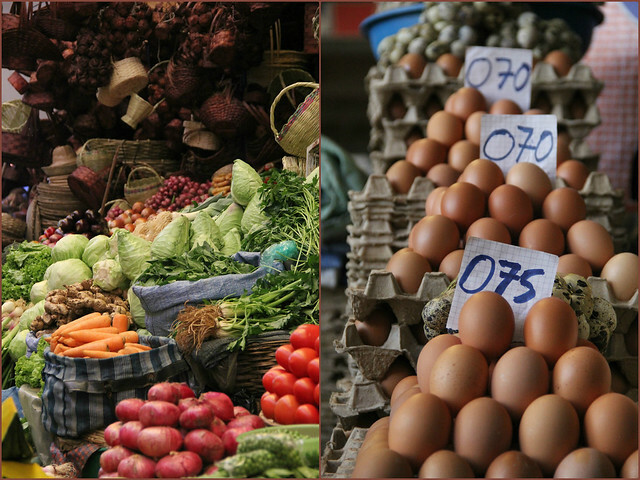 The middle level is where you’ll find the majority of the market’s produce for sale – every single ingredient you could possibly need to whip up a gourmet feast. You may want to avoid heading downstairs if you’re a vegetarian or at all squeamish (small white cubicles are occupied by butchers hacking away at bloodied meat), BUT the market’s bottom floor is also home to Sucre’s jugo ladies who make the most amazing fresh juice mixtures and fruit salads for just B7 (69 pence). Plaza Libertad is the location of Sucre’s hospital (pictured below), as well as a monumental obelisk, the Supreme Court, and a decorative white-washed arch. 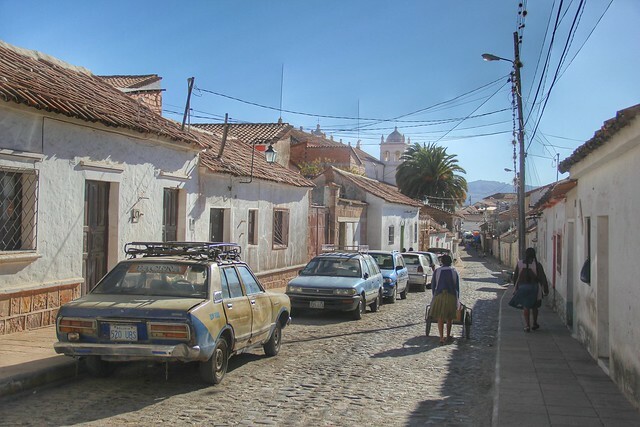 Although a small road linking the historical centre to the residential and business districts of Sucre runs straight through this small plaza, it’s a pleasant place to relax and people watch, and is far enough away from the major tourist drags to escape the crowds. Park Bolivar is just over the road as well, but personally I prefer it here. 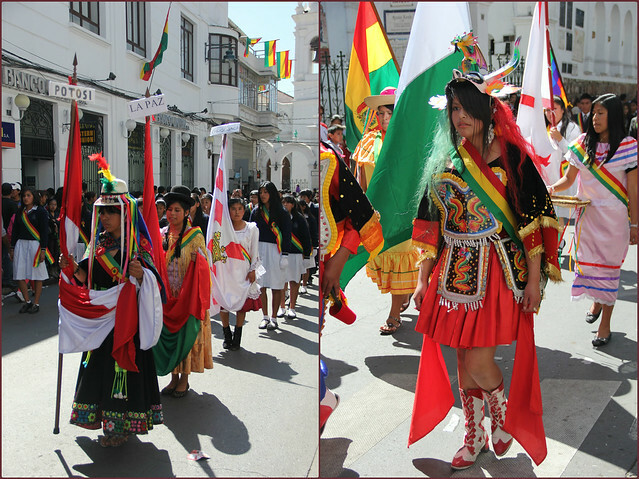 The day that Bolivia finally declared its independence from Spain was 6 August 1825. 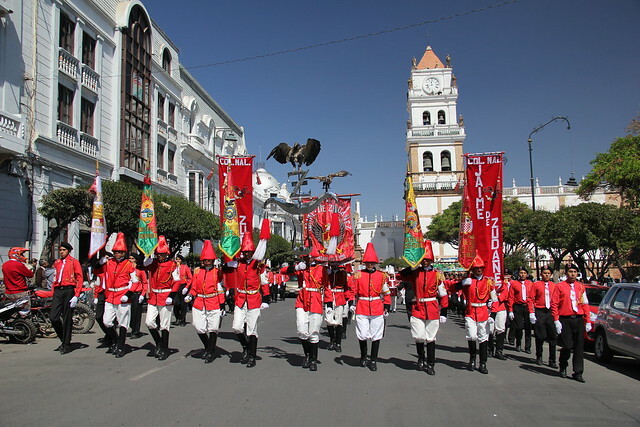 Every year Sucre marks the anniversary of this event by hosting elaborate celebrations in the city. Many of the city’s buildings are brightly decorated with flags, the streets are filled with colourful parades and marching bands, and in the evening the sky is illuminated by fireworks. 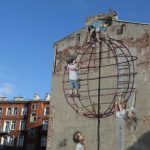 The positive, up-beat, and infectious vibe running through the town is amazing, and it was incredible to witness the sheer scale of the city’s festivities. Hostal CasArte Takubamba, a family-owned collection of converted historic buildings with original wooden framework and floors. 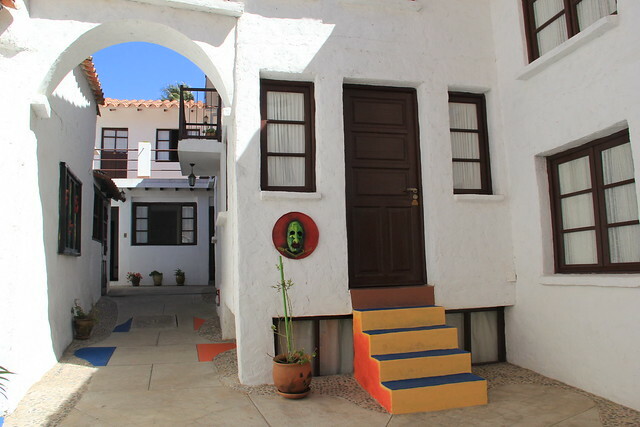 All the rooms are located around a sunny courtyard and garden, and the whitewashed exterior walls are decorated with colourful and unique pieces of artwork. The hostel is also perfectly located at the southern end of the historic centre and was literally around the corner from my Spanish School. Café Metro (right on the edge of Sucre’s Plaza de Armas) was my favourite place to stop for coffee, Condor Café (a vegetarian restaurant run by a non-profit tour company who organise a variety of hikes into the surrounding areas) was my go-to place for a spot of lunch, and in the evening I loved the dimly-lit, atmospheric Florin. Their Ensalada Titicaca and Pad Thai were my favourites, washed down with a craft ale or two (some of which are laced with coca!). I’ll be publishing a more detailed post, about some of the best places to eat and drink in Sucre, very soon, so keep your eyes peeled. Lonely Planet guidebooks are always my initial point of reference for planning trips. You can buy the latest Bolivia guide here. 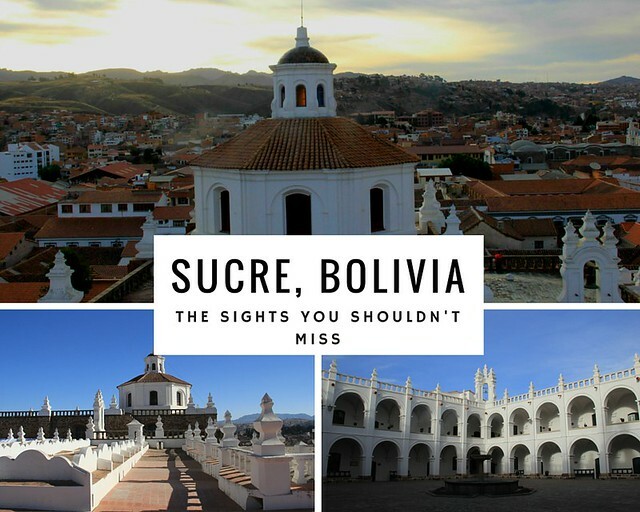 Have you ever visited Sucre? 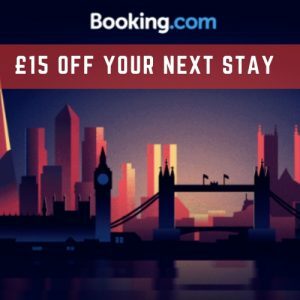 What were your favourite parts of the city? If you like this article, please please share it on social media using the share buttons at the top of the post. 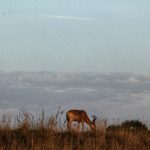 Alternatively you can follow along on Facebook, Twitter, or Google+ or you can look me up on Instagram or Pinterest too! I agree… Sucre is a white beautiful city! My favorite place was Plaza Recoleta, I always enjoy views from the top even if it’s tiring to go up there 😉 I also liked the market, went there to have breakfast and buy fruits. 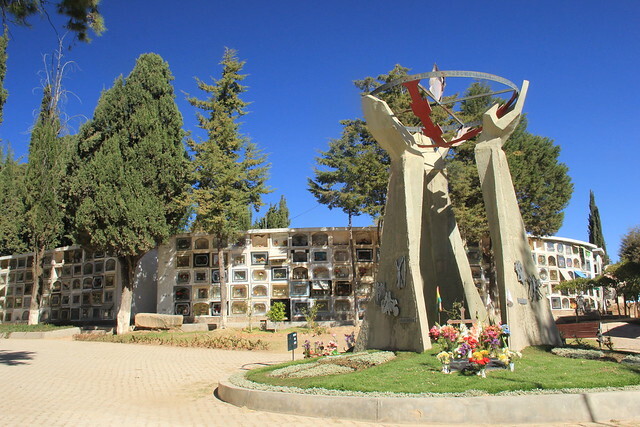 I didn’t know the schedule of the Cementerio and when I arrived it was closed. I don’t remember which time it was but it was probably between 11am and 2pm. Bad planning! Looks beautiful! I love smaller cities, they are a little more peaceful and less crazy but with plenty of fun things to see and do! 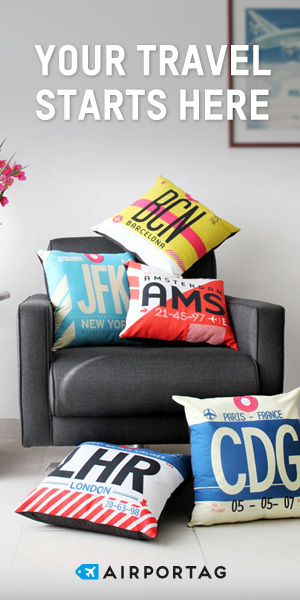 Where are you traveling next? Ah, I want to go to Bolivia so badly! It’s actually one of my top South America destinations for 2018. I actually hadn’t heard of Sucre before so now I’m super intrigued and am adding it to my list. 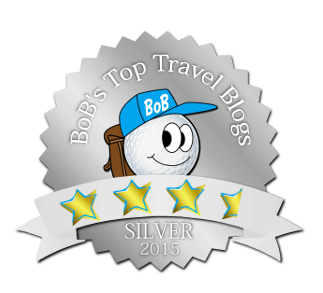 Great note about the Spanish school too – will check them out!